Entry level course in a small, grassy park with sporadic tree coverage and no underbrush. Short tees with excellent traction. Next tee signs hang from bottom of baskets. Loaner discs at rec center. Course is across the street from an elementary school. I-275; exit 24 (22nd Ave N) west 4.7 miles (passing Tyrone Square Mall) to a left on 72nd St N to the course on the right - 400 yds to parking on right. 1st tee at north end of parking lot behind map & rules signs. 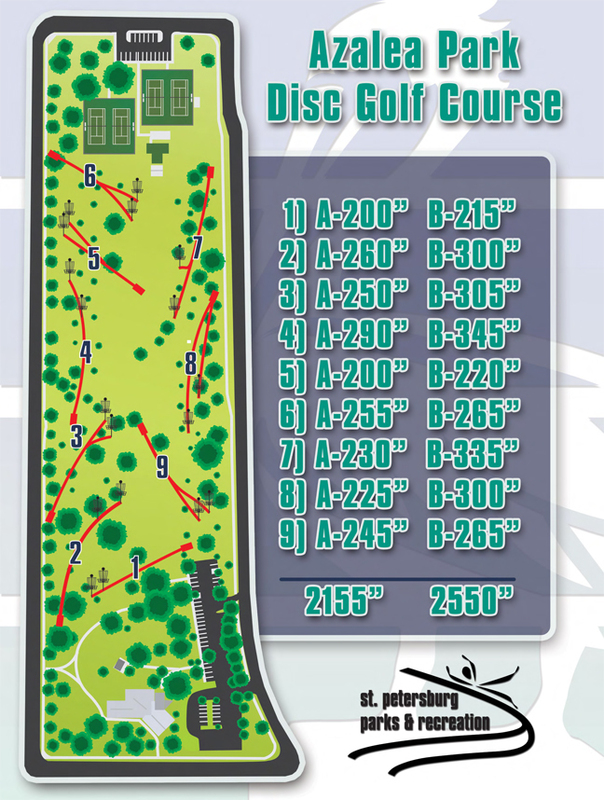 I took my family here Saturday, our first disc golf outing. What a great beginner's course!!! Each hole had layout signage to assist in throwing strategy, and the fairways were clearly marked with neon tape on the corresponding trees, and the direction to the next hole was clearly marked on each basket as well! We were able to get thru the course in about an hour (with a 7yr old). We liked it so much, we came back on Sunday with some friends of ours(an hour drive for us).